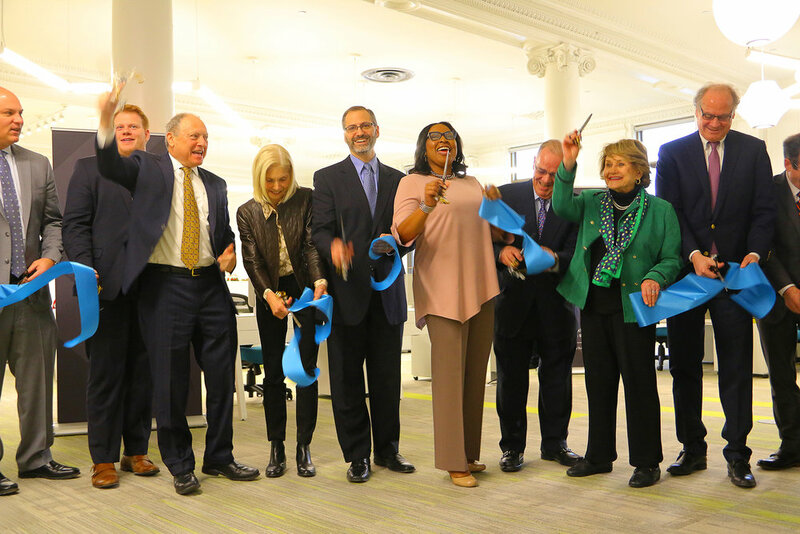 Today, we celebrated the launch of client partner NEXTCORPS—a not-for-profit formerly known as High Tech Rochester—in their new headquarters at the freshly renovated Sibley Square building in the Downtown Innovation Zone. This rebrand brings new latitude to their mission. As both a catalyst and a conduit, NEXTCORPS empowers innovation-based entrepreneurs to plug in, propel, and sustain the charge of ingenuity to achieve regional development with global economic reach. And Truth Collective is proud to have a hand in shaping that future, working on the brand identity, key messaging, look and feel, and elevation of neighborhood ethos. Both the name and logo point to that future, with the -corps element inciting a critical mass united by the spirit of cause. From the reception area, down hallways, and throughout common areas, we punctuated the space with key messaging for the brand’s unveiling. Rallying cries align the energy of NEXTCORPS’ promise through kinetic action words associated with its character. Governor Cuomo’s economic development czar Howard Zemsky spoke at the launch, declaring Rochester as upstate’s “Capitol for innovation,” and highlighting NEXTCORPS’ appeal as more than an incubator. As a destination for investors and inventors the world round, NEXTCORPS commands a community-oriented role in the immanent future of regional prosperity—based in the Rochester economy of today and accelerating toward indefinite global engagement tomorrow. Right in the Downtown Innovation Zone. We’re proud to announce that with our first three years of skin in the game, we placed 26th in the Rochester Chamber Top 100—a program recognizing the fastest-growing, privately owned companies in the region. Ranked by revenue growth over the three-year period in dollar and percentage increases, Top 100 businesses are also valued by community investment and the role we play in the local economy. This is a phenomenal opportunity to recognize the Truth Collective team. If you get to know our staff, it’s immediately clear why this is their achievement. Emerging as the leading marketing agency of Top 100 companies in our first application is proof-positive that we have a healthy, thriving business outpacing a variety of economic indicators for optimal performance. Our agency culture and environment are entirely determined by our people, and we’re grateful to have every one of our staff shaping Truth Collective. When we branded ourselves, we chose to leave our names and egos out, knowing the moment we made it about the leaders is the same moment we cap our potential. Next year, we want to be in the top 10. Minimum. Our team (which has since doubled in size), our values, and our product has created a deep level of client engagement with significant demand for our offerings. We value business growth as a key measure because we hire professionals that are driven and growth-oriented themselves. The only way for a team like ours to flourish is to continually create new opportunities for them to sink their teeth in, be vulnerable, and—with dedication to each other and extraordinary results—keep setting the bar higher. What better way to start getting to know our new ‘hood, Neighborhood of the Arts, than to explore its most exceptional places, hidden gems and secret spots? Started by Brooklyn-based digital shop Hyperakt and curated by creatives, On the Grid is a neighborhood guide on a mission to cover every corner of the globe. It’s not for tourists. It’s for explorers who want to see interesting architecture, vintage shops and go to the coolest local bars, bakeries, cafes and restaurants. So when it was time to put Rochester on the grid and we were asked to rep a neighborhood, it was obvious that we had to go with our new home—NOTA. Over the past few months, we visited restaurants, cafes, shops and galleries we’ve never been to before and some we have. We took notes and photos. And while we’ve covered a good amount of territory, we can’t wait to keep exploring and keep adding as we become part of the local NOTA scene. Check it out. Use our page as inspiration to try some new places in NOTA. Or, scope out other cities and plan your next out of town adventure. Either way, we’re pretty stoked that the ROC is now part of this global project—up there with cities like Paris, NYC and Hong Kong. The Decision to Move and Why Our Furniture Doesn’t Match. Truth Collective has never been about “headcount” as a measure of success, and we’re not about to start now. We have not set out to build the biggest marketing agency in our area but we are dead set on building the best one. As such, our staffing choices are different from most. So is our approach. In three and a half years, we’ve built a senior level team of marketing strategists, leaders and creatives that do not rely on headcount to feel successful. They do, however, rely on “headspace” to be extraordinary. That is precisely why we’ll be opening doors to Truth’s new home in just about a month. In the summer of 2013, our space found us. In every way, it was a gift from the business world, rewarding our leap of faith. It was a phone call from a business owner who was ready to invest in marketing again, and also had some space that he was renting. A cool space that came with a client—a gem of an opportunity that was too good to pass up. Yes, 2,500 square feet of renovated loft space was far more than just three of us (with 3 small clients) needed at the time. But it was never about what the three of us needed in the moment. Not investing in the right space, the big space, would’ve minimized financial risk. Sure. But it also would have minimized our potential to get to where we are right now. Somehow, we knew that. So we jumped in, rehabbed an old space to make it open, rustic and edgy. Then Truth started to flourish. 12 Aqueduct Street is an off-the-beaten-path spot in the center of downtown—in the middle of everything yet under the radar—just like us in those very early days. Our Industrial-infused home became the maker space we envisioned. We had everything we needed, nothing that we didn’t. It was enough to feel different when people walked in. No cubes. No private offices for execs. No curved reception desk. Just us—exposed in our natural habitat. 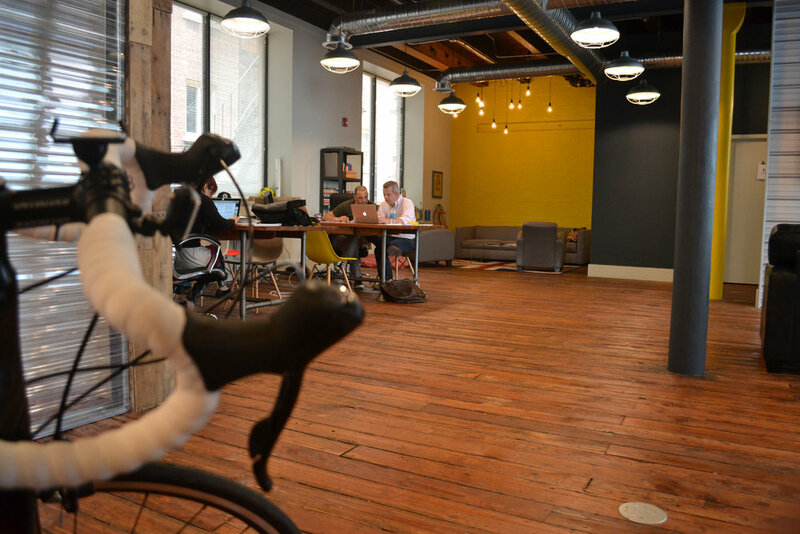 This approach helped us attract great talent that is like-minded and all about the work. Soon we needed to order more tables. Two by two, new sets of tables came in. Always mismatched from the previous sets, as consumer dining tables turn over stock at the same pace as our growth. Like a family in their first home, we hummed along, growing as a unit and starting to bump into one another in the kitchen. Signs of growth were right before our eyes. How many talented people can you seat at a dining table and still expect them to have the headspace they need to flourish? Time to consider a new space. Left braining the move. As the agency’s business leader, I ran through all the rational progressions; understanding the overhead percentages of our budget, the best practice “square feet per employee,” then plotted expected employees against our historical and projected growth rates. Ultimately, I determined that we would outgrow our current space somewhere in the second half of 2016. And you know what, physically, this is precisely when we did outgrow it. But despite having these projections and believing in them when they were just projections, we actually started, but then paused our search for a new home. A case of growth jitters I suspect. Right braining the move. There’s another side of the decision making process that had nothing to do with numbers and everything to do with the vision of the company and the feeling our brand needs to deliver when experienced first-hand. The emotional side of the space was gnawing at us. Our “headspace” once again needed space. As humans, we take cues for our thoughts and actions directly from our surroundings. The amount of natural light. The feeling of having your own personal room while directly engaged with others. The quality cues you can see and feel. Thoughtful design that is beautiful and functional and fresh. All these things should have a gestalt effect on all who enter. And when it does, the results speak for themselves. People are more inviting. They walk a little taller, with more purpose and pride. And, yes, their expectations rise too—of themselves and of others. Now you’re building something extraordinary. The decision to move needed to happen. Two by two-ing tables wouldn’t cut it anymore. And the hard numbers justified what we knew and still know to be true. This is a momentum that is not about to stop. So, we found the perfect location to take Truth into our future. Space worthy of the team it will house and the work we will do. Our new space at the Factory is more than an office building. It’s an environment deserving of the team that will thrive in it. It’s precisely how we’ve envisioned Truth Collective since our start. We never thought of ourselves as 3 or 6 or 10 people. We always think of ourselves in our future thriving state. We invest in things that serve us well today and will grow with us into the future. This move is not about square footage. It is about belief. Belief in our most extraordinary team of generous, truthful and driven human beings and our belief that we are just getting started. Let's just say we're comfortable with construction hard helmets and build-out plans. The Agency Post: Why Truth In Advertising Is Fanning the Flames of Invention. Just a month after starting Truth Collective, The Agency Post picked up an article by John Roberts for their July 11, 2013 post about truth in advertising. Rochester Business Journal: Three Execs Exit to Start Firm.